North Irish Militia retitled as Rangers. RANGERS support 1 R IRISH in air assault role. 4th (Volunteer) Battalion The Royal Irish Rangers (The North Irish Militia) retitled. The Territorial Army battalions of the three regiments of the North Irish Brigade were the 5th (Territorial) Battalion The Royal Inniskilling Fusiliers, the 6th (Territorial) Battalion The Royal Ulster Rifles and the 5th (Territorial) Battalion The Royal Irish Fusiliers. They were raised in 1947, but during the 1960s the UK government decided that the reserve forces should be reduced to become a smaller but better equipped and trained reserve. As a result, a new Territorial and Army Volunteer Reserve (TAVR) was established and battalions were designated for roles by 'Type'. The old battalions were much reduced in strength and became Type III with a home Defence role while a new Type II battalion was raised and titled The North Irish Militia (NIM). The TAVR Type II role was linked to reinforcement of the 3rd Division in the UK or to the British Army of the Rhine (BAOR) in time of war and the NIM supported the Regular Army battalions of the North Irish Brigade. HQ Company at Portadown, successor to 5th Inniskillings. A (Royal Inniskilling Fusiliers) Company at Omagh with a detachment at Enniskillen, successor to 5th Inniskillings. B (Royal Ulster Rifles) Company at Newtownabbey, Belfast, successor to 6 RUR. C (Royal Irish Fusiliers) Company at Portadown, successor to the 5th Faughs. D (London Irish Rifles) Company at Chelsea, London, and Hillington, Middlesex, successor to 1 LIR. The move of individuals continued when the Home Defence role was further reduced and the 5th Inniskillings, 6 RUR and 5th Faughs were reduced to cadres. These cadre battalions of the former regiments finally received the order to disband in 1974 - after the raising, on 1 April 1971, of the 5th (Volunteer) Battalion The Royal Irish Rangers. The word 'Militia' disappeared from the title when the Royal Irish Regiment was formed and the 4th (Volunteer) Battalion The Royal Irish Rangers (North Irish Militia) became 4 RANGERS - although the distinctive Militia badge continued to be worn in the caubeen. Finally, the cap badge disappeared when 5 RANGERS was merged with 4 RANGERS and eventually retitled The Royal Irish Rangers. 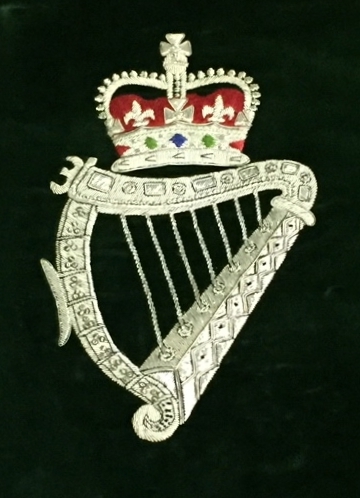 When the Home Service battalions of The Royal Irish Regiment were disbanded, The Royal Irish Rangers was retitled the 2nd Battalion The Royal Irish Regiment.